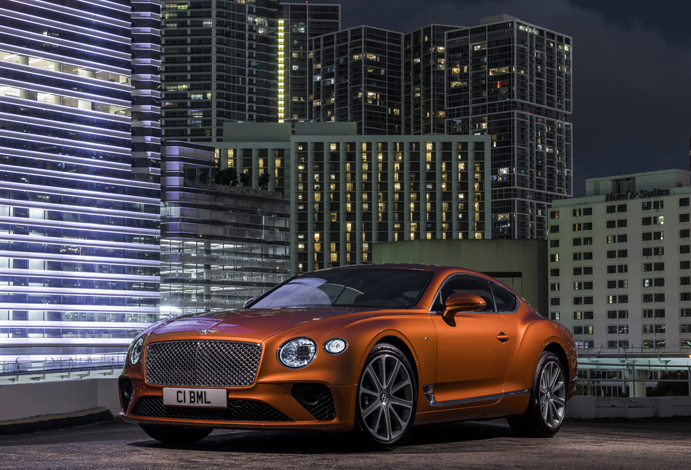 Bentley recently announced it will be introducing two new versions of its third generation Continental GT and GT Convertible models this year. The definitive luxury Grand Tourer is now available for US customer order with a powerful V8 petrol engine, ensuring a lively and engaging drive that complements the unparalleled levels of luxury and cutting-edge technology. Both V8 models are equipped with a new-generation 4.0-litre, twin-turbocharged engine developing 542 bhp (550 PS) and 568 lb. ft (770 Nm) of torque. It combines immense power with greater range, plus a characterful V8 burble though the stylish quad exhaust pipes. Designed, engineered and handcrafted in Crewe, Great Britain, the Continental GT V8 and GT V8 Convertible combine driver-focused performance with exquisite refinement and cutting-edge technology. Both cars feature 20-inch, 10-spoke painted alloys wheels, subtle V8 badging and a sublime, handcrafted interior. 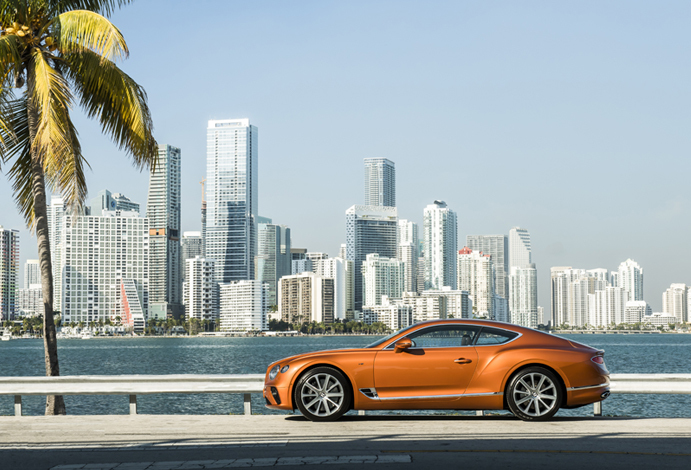 Bentley created the modern luxury Grand Tourer segment in 2003, with the launch of the first-generation Continental GT and, sitting at the core of the ground-breaking Continental GT line-up, the new V8 models offer customers a unique breadth of Grand Touring abilities. Customer deliveries will commence in the US in Q3, with availability for other regions to be scheduled from Q1 2020. The new V8 versions of the ultimate Grand Tourer combine immense power with impressive fuel efficiency. Excellent weight distribution makes the dynamic V8 feel even more agile and responsive with a distinctive, higher revving engine personality of its own. The new-generation 4.0-litre, 32-valve V8 petrol engine develops 542 bhp (550 PS) and 568 lb. ft (770 Nm) of torque. It also features dual twin-scroll turbochargers located inside the ‘V’ of the engine, together resulting in a top speed of 198 mph (318 km/h) and 0-60 mph in 3.9 seconds (0-100 km/h in 4.0 seconds) for the Coupe; and 0-60 mph in 4.0 seconds (0-100 km/h in 4.1 seconds) for the Convertible. Spirited performance from both eight-speed V8 models is complemented by refined efficiency, stemming partly from the ability of the engine to de-activate four of its eight cylinders in suitable conditions, without compromising the drive. The seamless change happens in just 20 milliseconds and is imperceptible to customers. Stop-Start technology, which operates at ‘near-to-stop’ speeds, is also available. 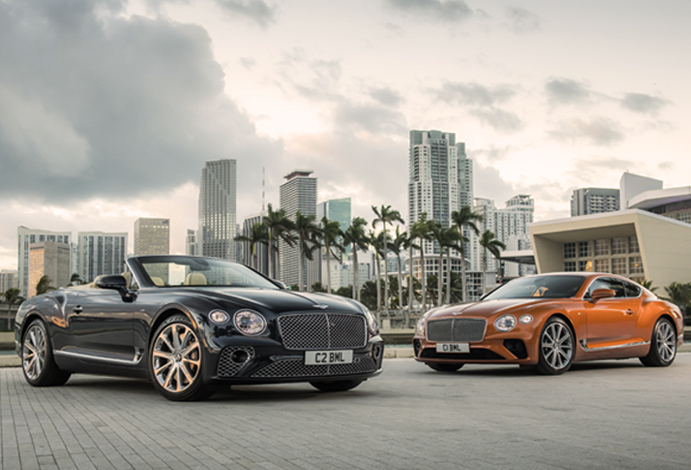 A statement of true luxury, the third generation Continental GT and GT Convertible represent the pinnacle of Bentley’s design and engineering achievements. Effortlessly elegant and more sculpted and sharply defined, the body and materials combine to create truly breath-taking cars. The new V8 models feature 20-inch, 10-spoke painted alloy wheels and the option to choose from nine other designs measuring up to 22-inches. Bentley offers seven standard exterior bodywork colors, with an extensive palate of additional paint choices available. Both GT V8 and GT V8 Convertible are distinguished by quad exhaust pipes and subtle V8 badging to the front wings. The GT V8 Convertible’s tailored roof can be deployed or stowed in just 19 seconds, with the car travelling at speeds of up to 30 mph (50 km/h). 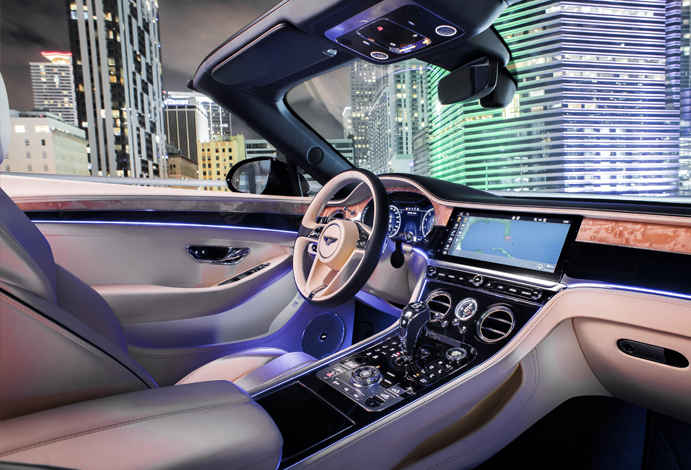 This transforms it from a luxurious coupe into an open-top Grand Tourer at the touch of a button. Seven different fabric hood colors are available, including an authentic tweed finish for the first time. A newly designed neck warmer (which is both warmer and quieter than in the previous generation model), is seamlessly integrated into the heated and vented Comfort Seats, optimizing efficiency and airflow around the electrically adjustable headrests. The styling highlight of the new neck warmer is a chrome center vane that stretches the full width of the duct, echoing Bentley’s famous ‘bullseye’ vents. Combined with a heated steering wheel and new heated armrests, these sophisticated comfort features create a luxurious driving experience in all environments. The V8 models also employ the latest LED Matrix technology, while the design of the headlamps is inspired by the finest cut-crystal glasses. The result is similar to that of an illuminated cut gem, an effect which is magnified when the optional welcome sequence gradually illuminates the headlights as you approach the car. The Continental GT V8’s innovative, luxurious interior offers unrivalled Grand Touring refinement. It seamlessly integrates natural materials such as the highest quality leathers and rare, sustainably sourced veneers into the finest handcrafted cabin. Twenty-way adjustable leather seats set new industry standards in comfort and refinement and are available in a monotone color split on the GT V8 and GT V8 Convertible. Four further color split options are available, together with Contrast Stitching, Piping and Hand Cross Stitch. New Crown Cut Walnut adorns the V8 fascia and other areas, with the option of a variety of exquisite wood veneers. V8 models also feature a 10-speaker Bentley Audio system as standard pumping out a powerful 650 watts of entertainment. At the heart of both the GT V8 and GT V8 Convertible dashboards are an advanced, fully digital, driver-focused instrument panel and the optional Bentley Rotating Display. The latter features a 12.3-inch touchscreen housed in a three-sided unit, which revolves the veneer to reveal the touchscreen, as well as three elegant analogue dials. Inside the new GT V8 Convertible, the ultimate Grand Tourer for all seasons, customers can choose from a range of eight roof lining colors. The driving dynamics of the Continental GT V8 and GT V8 Convertible offer the driving character expected of a class leading Grand Tourer, along with the opportunity to explore the range of performance the car has to offer via the Bentley Drive Dynamics selector. The different modes available offer the customer the full breadth of performance, from class-leading refinement and comfort to focused handling in Sport mode. 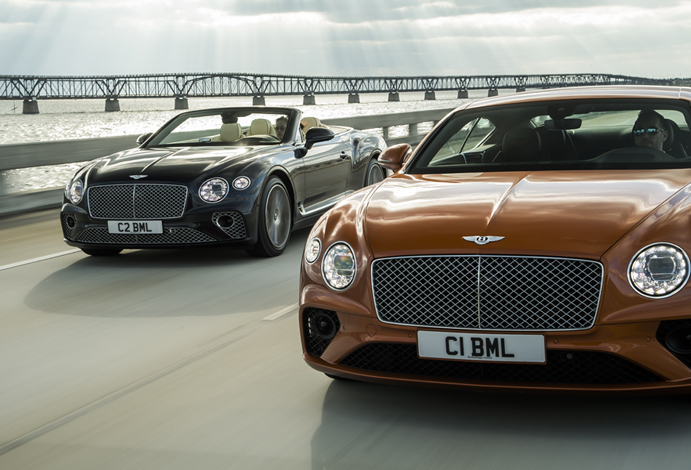 The Continental GT V8 and GT V8 Convertible are both equipped with front and rear hollow, lightweight anti-roll bars for exceptional handling while the technically advanced, adaptive chassis created for Bentley’s intelligent Dynamic Ride System is also available as an option. 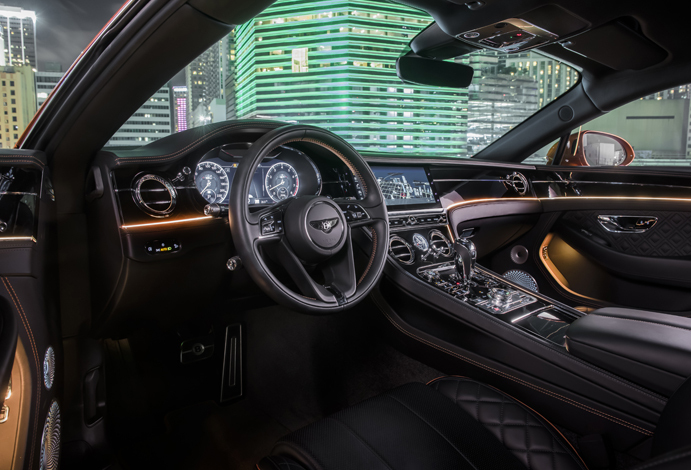 The Dynamic Ride System controls ride comfort and lateral roll, cushioning passengers from excessive movement, as well as making the Continental GT V8 models feel effortlessly precise. The air suspension uses three-chamber air springs which further improve ride comfort and the dynamic character. It has the scope to vary from sporting spring stiffness to luxury limousine refinement, depending on which mode is selected. An Active All-Wheel Drive System varies the front-to-rear torque split dependent on the driving situation. The Continental GT V8 will use rear-wheel drive as much as possible during normal driving for optimum efficiency and dynamic performance. Electric Power-Assisted Steering provides excellent feedback to the driver. It utilizes a variable rack ratio, allowing increased response with higher steering angles to aid maneuverability whilst maintaining excellent stability at high speeds. The V8 models are offered with a wide range of driver assistance features, such as Active Lane Assist, Traffic Jam Assist and Park Assist. Continuous Damping Control optimizes comfort and handling, by constantly adjusting the damper forces in response to road inputs, vehicle movement and driver demand. It does this by continuously measuring the velocity and distance between the wheels and the body at each corner and adjust to optimize comfort and handling. The 10th of July 2019 marks Bentley’s 100th year. This extraordinary milestone – reached by only a special few companies – will be a cause for celebration of the company’s history and its global success today. For more information, please visit www.bentleymotors.com.